Bye Bye 16th Amendment, the Corporate Tax, & the IRS! How does the 16th amendment help business? It authorizes the "progressive" income tax. We all know that more than a mechanism to feed the government's need to defend us, and to enable highways to be built and other things that individuals cannot do by themselves, the income tax is used for wealth redistribution. The workers somehow do not like that, but the non-workers, especially the deadbeats, really do. It is good to help the helpless. It is not good to make people helpless. So, it is not good to help make poor people out of those who otherwise would be fruitful contributors to their own lives. Yet, we know this is what government does all the time. The sixteenth amendment provides the funding for the big government appetite. The notion of giving to those who should not need anything returns nothing to the people. The government really decides way too much for the people. And, the government is mostly full of dunderheads, blockheads, and pigheads who don't know their back end from a hole in the ground. The income tax is a convenient vehicle to manage the people's purchases via tax exemptions, credits, and deductions. How does government know what is good or bad for you or for me? We know they use the three branches of government to determine this information. Again, they use their elete DBP team trio-- (dunderheads, blockheads, and pigheads). Why should we care what they think about what we do? Because they own all the weaponry for a start. That's a good reason to listen but there are not many others when government stops adhering to the Constitution and the wishes of the people. We all know that the government, including congress and the president, rarely do much good nowadays, and often behave exactly the opposite of the people's wishes. Anybody seen an illegal alien working or shopping or having a beer recently like as if they were really concerned about the government catching them? The government is not even looking to do its job. Most in government seem to be asleep or too inept to make a positive difference. If that is not the real truth, it sure seems so! The last thing any of us really need is to have one of these well-intentioned buffoons in charge of something important -- like our personal health. Since we need taxes to support the good parts of government, the best tax is clearly a consumption tax since everybody pays something. You have seen waitresses and waiters and personnel in other service areas that treat your family well when serving them. I sure have. The servers smile like they love you but they most often expect that they will be rewarded for that attention. And they are. We know that they prefer to receive cash, rather than have the tip recorded on a credit card bill. Why is that? It's because cash can be hidden from the IRS once it hits the wallet, and thus it is unreportable to the government. Income taxes are based on income but if the IRS knows nothing about your income, then there is no tax. So, somebody who is retired with no income, who has a big wad of money tucked aside from earnings years ago, pays no tax even though they have all that money available. They pay tax only if their investments earn some interest. If not, they pay no tax, and in many cases, with the help of expensive accountants, they figure out how to pay no taxes anyway. The Fair tax takes away that inherent unfairness. A consumption tax would force people working in those occupations, along with the stay-at-home rich retirees and others, such as the crimial element, who spend a lot more than they earn, to contribute their fair share in taxes. That's why it is called the fair tax. Nobody is excluded. Whenever you spend a dime with a consumption tax, there is a tax to be paid. But, there should be no income tax and no long tax return to fill out at the end of the year if the tax is brought in right. When the service workers eventually spend their tip, under the Fair Tax, they would then pay a tax, regardless of whether you paid them in cash or your charge card. So, the income hiders would be paying more taxes but those of us reporting honestly would merely be paying our "fair" share. Some of you may hear what I am saying and you may conclude that the Fair Tax is really just a fancy name for the Value Add Tax or VAT that has brought Europeean nations to the brink of banruptcy. The VAT is used extensively in Europe. It permits the government to keep the unfair and incredulous income tax and then, on top of that, they slap a 20% or greater national sales tax on all elements of the supply chain from the manufacturer to the wholesaler to the retailer. Each adds their value and each adds the tax. 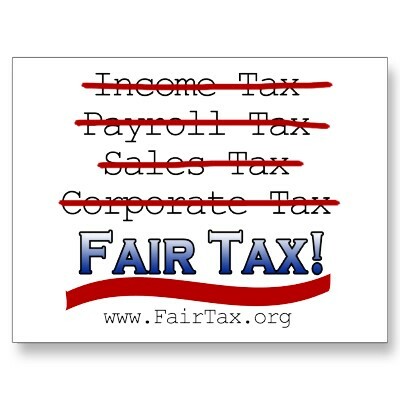 A Fair Tax is a national sales tax. Yes it is. However, it is assessed only at the retail level. In my plan both the income tax and most, if not all of the corporate income tax would go away as a precondition to the Fair Tax. I would use the corporate tax as a vehicle to help keep jobs in America. Those corporations who play right and give Americans jobs in America would pay minimal taxes to no taxes. To incent foreign manufacturerers to set up shop in America, profits from products manufactured in America would not add anything to the corporate tax burden. So, a Fair Tax can save the money the government once used to pay most of the IRS to find those who hide income. The 16,000 new IRS agents for Obamacare at multiple billions of dollars salary cost would not be needed. In fact, the IRS as we know it would not be needed. It would be eliminated. Instead the tax would be applied evenly on all matter visible on the table in which it is spent. In other words, there would be no more under the table economy. A consumption / sales tax would therefore force those operating outside the current income tax system to pay their fair share -- whether they are legal or illegal. In this way, nobody gets public services for free. Nobody! Why is that not something that we all like? Anybody with a job and those who receive money from those with a job all pay taxes. This lifts the burden from only those who work to all people who consume -- all of US. There is a notion that a sales tax can be a very practical measure by which we will gradually wean ourselves off of our dependence on federal and state services. By slowly lowering the percentage of the tax over time, the size of the government overall can shrink and government services can eventually be returned back to state control where they belong or perhaps, other than those deemed extremely essential, they will be ended entirely. So that you understand the salient components of the Fair Tax Plan, I have captured from the http://www.fairtax.org/ site, some of its essence below. Another site worth visiting is a debate on the pros and cons of the fair tax. Click here to see the pros and cons. Please repeat more slowly: What is the Fair Tax Plan? The Fair Tax Plan is a comprehensive proposal that replaces all federal income and payroll based taxes with an integrated approach including a progressive national retail sales tax, a prebate to ensure no American pays federal taxes on spending up to the poverty level, dollar-for-dollar federal revenue neutrality, and, through companion legislation, the repeal of the 16th Amendment, and a major decrease, perhaps to zero of the corporate income tax. It is a jobs creator for sure. The Fair Tax Act (HR 25, S 296) was crafted as nonpartisan legislation. (Because it has a number it means it has been tried before but it has failed because the Congress does not understand it and the people are not demanding it be done.) This version of the bill abolishes all federal personal and corporate income taxes, gift, estate, capital gains, alternative minimum, Social Security, Medicare, and self-employment taxes and replaces them with one simple, visible, federal retail sales tax administered primarily by existing state sales tax authorities. A huge plus of the Fair Tax as we have discussed in this article is that it would significantly broaden the tax base. Illegal activity (such as selling drugs) that creates large amounts of income would now get taxed. Under the current system we just get lots of rich drug dealers. Under this system they would get taxed every time they buy something. Along the same lines, this would also tax illegal immigrants. This would go a long way towards solving the illegal immigration problem. How can we go wrong with a real FAIR tax?